3M Reusable Hot/Cold Therapy Pack, 4 x 10 Inch is an elongated hot/cold therapy pack that can be stuck in either the freezer or the microwave for therapeutic purposes. Great for spot placement of sore muscles and joints, the user can place it anywhere as a cold pack, place it in the microwave, then use it again for heat therapy. The pack is made using a thick plastic material and is filled with a gel-like substance for added versatility. The 4-Inch x 10-Inch size allows it to be wrapped around a limb or used on a single, longer limb area. 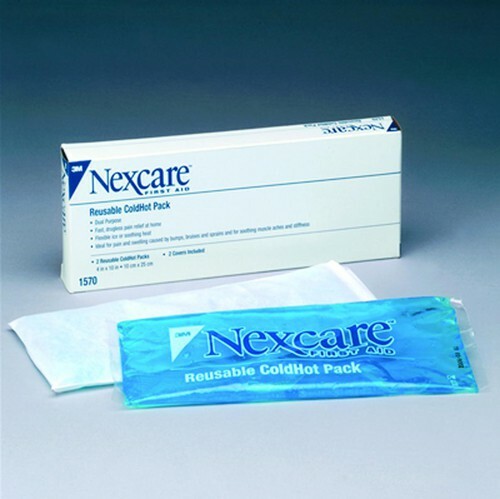 The reusable pack is made without latex, avoiding allergic reactions. We have had 3 of these for many years. They each have a light flannel cover with a velcro-ended strap. Is the current cover also a light fabric? or is it paperish? I am using this as a cooling device in the very hot weather playing tennis. I thought it would keep me cooler. With the short break in-between odd games, it really isn't thick enough or long enough to do the job.